Phil Hellmuths entrance to the Main Event is way more arrogant than Anette_15 trying to give an honest answer to a specific question. Personally, what I noticed most was that her accent shows. That's something new. Interesting how two people can get so different impressions of a quick video clip. I did not detect the arrogance you apparently attributed to her. I thought her answers were concise and informed. She readily admits that she will not be playing the $50K events because she is not ready and she says she would like to go deep, not win when referring to her first WSOP main event in the USA. Interesting. She puts down Doyle. He could turn her into jelly, even wilth his failing health. Flash in the pan. She won't sustain. Furthermore, anyone who has won so much and done so much for poker, such as Doyle, should not be talked down. You won't even know her name a decade from now. Living on luck. 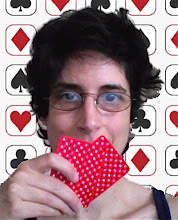 Pokergrrl has pointed out how long it takes for luck to even out. I hope this one goes fast. She does not put down Doyle, she just remarks that she would rather play against the old school players rather than the young internet players. She has played Doyle heads up before and he made several positive comments about her and her play. Study that tape and learn from her. She looks at and studies her opponents. @Aki: Which part should I learn from? The part where she says that a middle-aged guy who gets a beer and is lively and sociable is obviously "not going to be a good player." REALLY? The part where she says that when all she sees is a bunch of young kids she just assumes they going to be good because "most of them are." REALLY? She would rather play at a table of "Old School" players than the top online internet folks. I can understand that, as the internet style folks have learned to play against each other in a specific kind of way. She might find, however, that the best "Old School" players BECAME long-term survivors by learning how to adapt, and might not be the easy marks she seems to feel they are. I was probably a little harsh on Annette, as what she has to say toward the end of the video is quite reasonable ~ particularly the part about not having to beat everyone in a huge field, just the people at your table, hand by hand. Deep apologies. I called you Pokergrrl, Cardgrrl. Very sorry. Anyways, bottom line is it's pretty silly to get all worked up over the opinion of one person without much live experience.